I love going to the Japanese markets. Visiting is even BETTER when you have a Japanese friend with you to translate and explain things. Lucky for me, my friend offered to take me on a pleasure cruise of some of the markets here in San Diego this week. We were happily wondering from market to market and aisle to aisle, reading nutritional labels and learning about what foods she likes best when I stumbled across the most glorious site I had ever seen... Japanese wool felting supplies...a lot of them. Sucker for packaging, this roving came home. That was a no-brainer. I stopped in my tracks and said, "What is THIS?!" My friend said she didn't know, to which I quickly replied, "I know EXACTLY what this is." Needle felting is one of those things I am attracted to. Much like fabric, I buy all the needle felting supplies I run across and they sit. But have you EVER seen a book this cute? Two Japanese Needle Felting books added to the collection. I can't read a word...but luckily they have great photos to follow. Cheers, Rio Fukuda- I love the book you wrote on desserts! I've never seen a felting display as large as the one I saw at the market... the prices! They were less than what I have been paying at American felting supply stores (if you can ever find any). Any felting supply (wet and needle) you could need was there. I was beside myself. 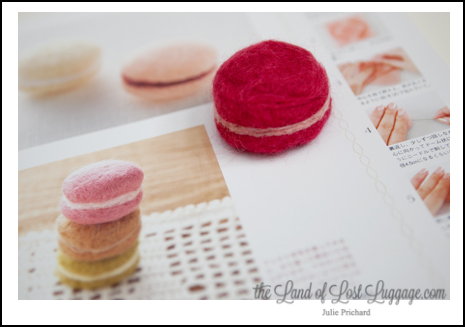 These books are marked, "Heart warming life series" and they are full of the most magnificent needle felt objects I have ever seen. A little charm I made for my friend. As if the needle felt discovery wasn't enough, we found so many other delights. American advertisers should take a lesson from our Japanese friends...because I am sucked into their packaging like a bug to a night light...I'd buy everything if I could! Clockwise from the left: Comic books, the mecca of needle felting, Japanese deli-wrap with hearts on it, my favorite cookie of all time. Thank you for stopping by and coming on my tour. I am addicted to all things Sanrio and CUTE. It was so fun to market hop this week. PS- I almost forgot: here is the website for the company that makes the roving. Talk about eye candy! Here is the first book I bought, and the second. Over the Weekend... Fall road trip!